2012 PCF Beach Cruiser Triathlon, Official Results! Notes: Ring support usually refers to top of the dip, but today we will be working on support in the bottom position of the dip with biceps touching the rings. This is the finish position of the transition in a muscle up. Notes: There is a 10 minute time cap. Racks may NOT be used for the Front Squats. Substitute Muscle-ups with Burpee Pull-ups or perform 18-14-10 reps of Pull-ups or Dips. Then, immediately at completion of WOD or whenever the time cap is reached, Max Sit-ups, 2 minutes. 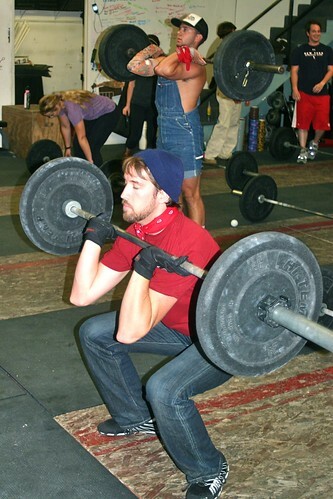 So easy he Front Squats with his eyes closed. There are three races coming up that I wanted to open up to the gym to see if anyone is interested. Let’s get a team together and represent! The 35th Annual Santa Monica Venice Christmas Run is coming up quick on Saturday, December 8th! You can run a 5k, 10k, or do both races back to back! Registration is $40 for one race or $45 for both and includes a long sleeve tech t-shirt. Let’s represent PCF in our soon to be new home of Venice Beach! Keep the endurance coming with the New Year’s Race Half Marathon on Saturday night, January 5th, 2013! I’m already signed up and super pumped to do a race with a 9pm start time. I can’t wait to run through downtown LA at night and celebrate after! Registration is $125 and includes a finisher hooded sweatshirt and a fancy looking finisher medal. The finish line festival goes from 6pm to 1am and Sierra Nevada is the official beer sponsor. Done. The LA Marathon is only 120 days away on Sunday March 17th, 2013! Runners on the Westside are out in full force training for this race already. Most people train up to six months for this race alone. Sign up and start your training while you still have time! 25,000 people run this race every year. Join them and finally cross it off of your bucket list! Holler if you are interested in any of the above events. Also make sure to shout out any other races you have coming up so the gym and its members can support you! As always, please let me know if you have any questions about training and how PCF can help.